Dance had always been her passion. She has pursued this passion as early as one can trace. She learn classical dance from the very beginning. She is an eminent Odissi and Manipuri dancer. She has created her own dance troupe. She choreographs her own staff. 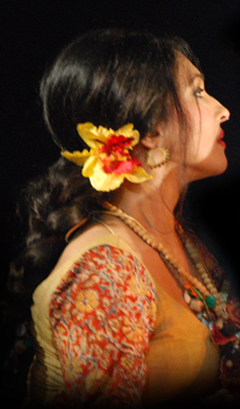 She has given tribute to Tagore by performing his dance dramas. She has choreographed Tegore’s dance in different way. Chitrangada, Chandalika, Shyama, Shapmochan and Mayar Khela were among her many creations. The actress choreographed Tagore’s ‘Swadharan Meye’ and ‘Sagarika’ of the famous insightful novel “TEEN ADHYAY” by Rabindranath Tagore with cultural brilliance. She has performed with her troupe on the celebration of 18th anniversary of The Response Group at Nalban.